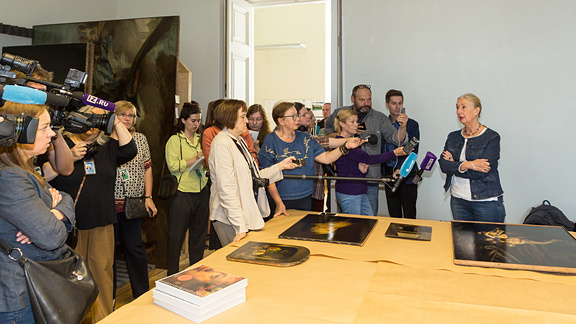 On 20 August 2018, a meeting took place in the State Hermitage’s Laboratory for the Restoration of Easel Painting between journalists and Irina Alexeyevna Sokolova, the Keeper of Dutch Painting, and Victor Anatolyevich Korobov, the head of the laboratory. The meeting was held in anticipation of the forthcoming exhibition of Dutch art – “The Age of Rembrandt and Vermeer. Masterpieces of the Leiden Collection”. “Eight paintings from the collection of the State Hermitage will enter into conversation with works from the Leiden Collection. This is a modest and respectful move that makes it possible to show the two collections in dialogue,” Irina Sokolova said as she presented the works to the journalists. At present four of the Hermitage’s Dutch paintings that will become part of the exhibition are in the restoration laboratory: Head of a Grey-Bearded Old Man by Jan Lievens, Old Woman by a Fireplace by Jacobus Vrel, Sarah Bringing Hagar to Abraham by Adriaen van der Werff and Herring Seller by Gerrit Dou. “A cosmetic restoration is being carried out in advance of the Leiden Collection exhibition. The paintings are in stable good condition,” Victor Korobov stressed. The exhibition “The Age of Rembrandt and Vermeer. Masterpieces of the Leiden Collection” has been organized by the State Hermitage and the Leiden Collection (New York, USA).